Vivotek is the latest 'big name' to jump into the 5MP product market. While the true value of multi-megapixel cameras are debatable, the market mantra in IP Video has been "more pixels, more cheaply" for several years. Does this latest announcement from Vivotek magnify this trend? In this note, we examine this new release and its impact. 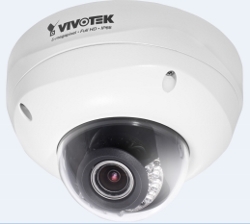 Pricing for this Vivotek camera is roughly equal to the Avigilon and Arecont models, but has the addition of IR illuminators built-in to the camera. The FD8372 is notably less expensive than the 5MP Axis P3367 (~$250 USD). While Vivotek has integrated IR which the 5MP Axis lacks, the Axis P3367 incorporates 'Lightfinder' low light technology. Indeed, Axis rates their 5MP dome's minimum illumination the same as their own SD camera (0.04 lux each), implying that Axis believes their new 5MP dome is as light sensitive as their existing SD offerings. Ultimately, testing will be needed to evaluate the low light positioning of these entrants. Characteristic of multi MP cameras, all cameras above have a maximum frame rate between 12 FPS - 14 FPS at full resolution.